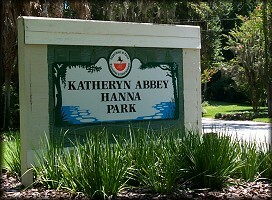 Kathryn Abbey Hanna Park, encompassing 450 acres on the sandy shores of the Atlantic Ocean, is located about 17 miles east of Jacksonville - just south of Mayport Naval Station. 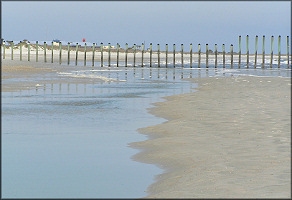 The park has 1.5 miles of sandy beach and is noted for its fine surfing at an area known as "The Poles" located at the extreme southern end of the Mayport Naval Station Beach. The original "poles" long ago succumbed to the vagaries of the sea but have recently [June, 2004) been rebuilt in a limited fashion. 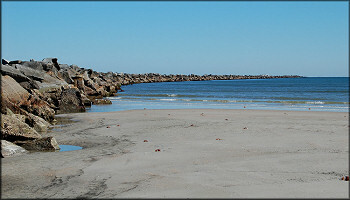 Discussion: This city-run park also provides access to the Mayport Naval Station Beach which extends northward about 1.5 miles to the south St. Johns River Jetty. Crossing onto the Navy controlled beach in the past was no problem. However, with the advent of the "war on terrorism" the beach is well guarded and only those possessing appropriate identification will be permitted to enter. The park is a popular weekend destination and during the summer months can become quite crowded. Shelling: Mayport Naval Station Beach and the northern portion of Hanna Park are two of the most productive shelling areas in the county. 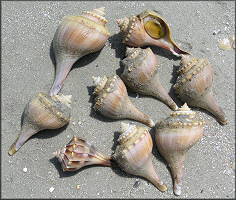 But like other northeast Florida beaches, it can be a hit-or-miss proposition (i.e., some days are very productive while on other days the beach can be devoid of shells). 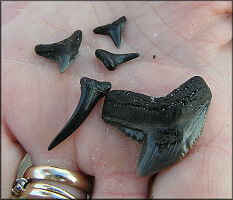 The best shelling is 2-3 days after a "northeaster" or other similar rough seas. 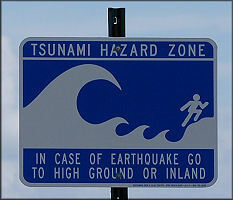 The area known as "The Poles" can be especially productive due to a sea bottom/current anomaly which also produces the waves craved by the surfers. Some collector's items which can occasionally be found are Triplofusus giganteus (Kiener, 1840), Oliva sayana form citrina Johnson, 1911 and albino Busycotypus canaliculatus (Linnaeus, 1758). The surfing Auger, Hastula cinerea salleana (Deshayes, 1859) are quite prolific during the summer months while March/April are the prime months to collect Epitonium. Eleven Epitonium species have thus far been collected here. Don't overlook beached marsh grass which can yield a treasure trove of small crabbed specimens. One such tangle collected during 2000 yielded an amazing 3,952 shells representing 59 species. See: A Remarkable Catch There are no restrictions on the collection of live shells. 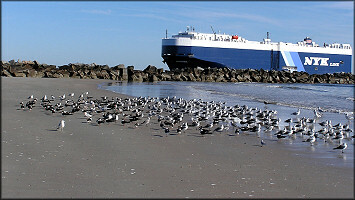 Because of their proximity to the St. Johns River shipping channel, these two beaches are "renourished" about every two years during channel maintenance - an event which has a disastrous effect on the living mollusk population.